For us a species-appropriate attitude of the animals is one of course - that means with the necessary time for rearing as well as natural and GMO-free feed. That's the basis for the excellent quality of our products. Our pigs, cows, sheep and goats spend the summer months on the pasture and then on the alpine meadows. We produce the valuable cheese from the milk of our cows that is obtained there. The whey, herbs and grasses of the alpine meadows are fed to the pigs. The processing of the products is done professionally by the son Martin, a trained butcher. 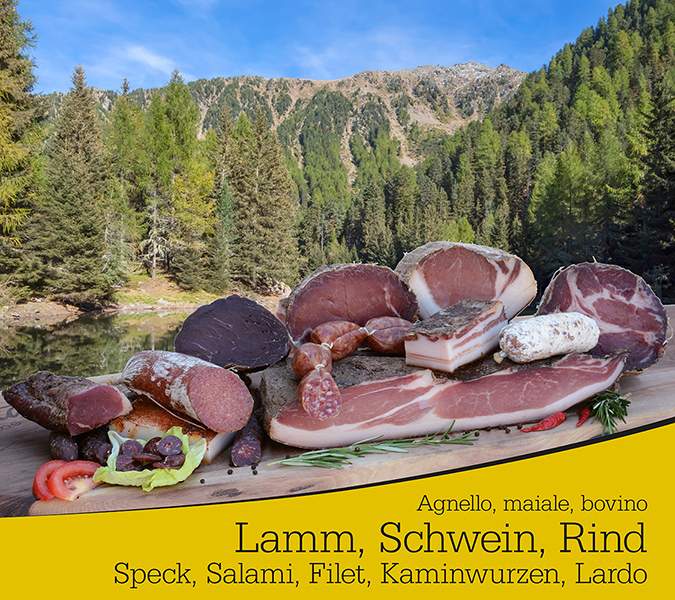 South Tyrolean bacon (Lardo, lean, belly), Bünderfleisch, various salami, smoked sausages and cheese. For example, our bacon is characterized by a fine grain, tarts consistency, the fine salt-spice mixture and the long maturation period. You get our products at the farm, in the Vinschger farmers' shops as well as in markets. Exclusively for Germany: for South Tyrolean delicacies -www.suedtiroler-schmankerl.com.